Tourism Ontario invites municipalities to market attractions in rest area and tourism offices along the 400-series highways. The Municipality of Bayham tendered development and design of a take-away lure booklet to promote Ontario Tourism Centres visitors to travel what is now a tarmac highway on top of the former “plank road”. 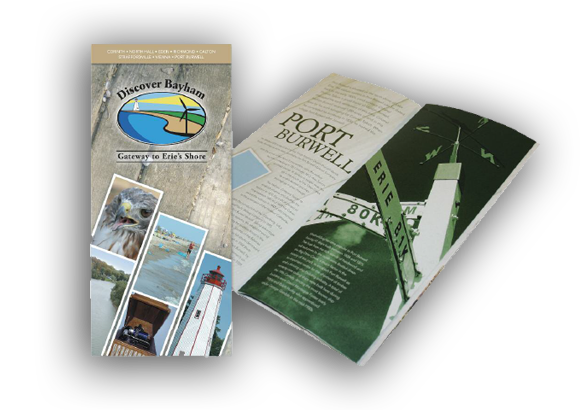 Points of interest were identified during a series of public meetings to harvest the folklore history of long-vanished sites and to develop sell copy to standing historic sites along the route to its culmination at Port Burwell on Lake Erie. Response was able to follow directions offered by a long-time resident and uncover remains of the original plank highway for the cover of the booklet.